How old is your version of SAS software? 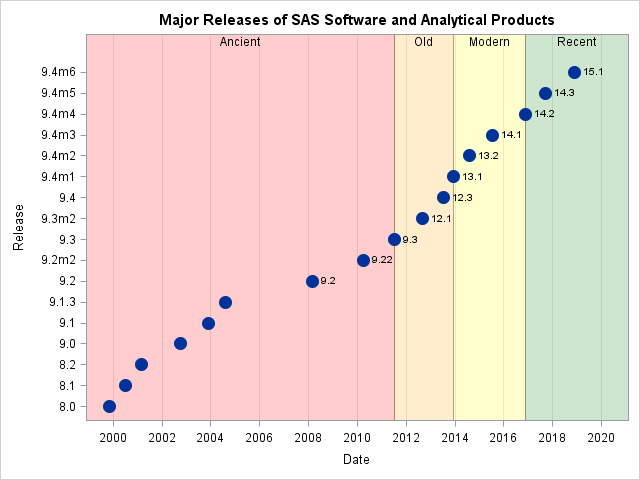 The graph on the left shows the release dates for various releases of SAS software, beginning with SAS 8.0. The graph is based on a graph on Jiangtang Hu's blog that shows the major SAS releases. As this graph demonstrates, SAS software is always evolving. Each release includes features that simplify tasks that used to be more difficult. For example, this graph demonstrates a new feature of SAS 9.4: The colors in the background of the graph are specified by using the STYLEATTRS statement in the SGPLOT procedure. This new feature makes creating the graph easier and faster. Earlier versions of SAS required a more complicated syntax to specify colors for groups. Recently a SAS user asked me how to compute some quantity in SAS. But before I could respond, he added, "By the way, I'm still running SAS 9.1." That addendum certainly changed my response. The solution in SAS 9.1 was complicated. A feature added to SAS 9.2 simplifies the solution. Unfortunately, the customer could not yet take advantage of the simpler approach. 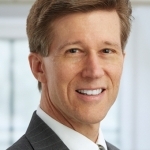 At SAS Global Forum 2012, Senior Vice President of R&D Keith Collins invited the attendees to "come along with us" as SAS releases new versions of its software. Of course, in large corporations this is sometimes easier said than done. However, if you want to start a conversation at your company about upgrading to a more recent version of SAS, this graph helps to put the SAS release numbers in a historical context. /* Approximate ship dates for major releases of SAS software. Editor's Note: This post was revised in November 2018 to include the latest release of SAS software. Unfortunately SAS 9.4 requires an operating system upgrade to 64-bit Windows. You have to dig a little to discover this crucial point. Changing the operating system is usually a problem in a managed corporate environment. SAS is currently evaluating providing Windows 32-bit support for a select set of SAS client applications with the release of 9.4 M1. When a final decision is made, an update will be posted on support.sas.com. That was only true for the initial release of SAS 9.4. Subsequent releases continue to support 32-bit windows. Nice graph Rick and thanks for trackbacking. You may modify the yaxis a little bit to show the big leap from SAS 8 to 9. Our staffing is down by about half from where it was 4-5 years ago. Unless there is a security issue migrating to new versions is way down on the list of priorities. Upgrading SAS versions applying Fixes to a SAS installation is very difficult to achieve. Would be great when this would made easier. Replacing something as a mobile/tablet is very common, don't like the model->get a new one. Updating Windows, java etc (fixes)? These patch rounds are commonly followed. Replacing DBMS/major versions (or other middeware) is already becoming more challenging. Updating a SAS installation? Fix or release? Woh that is a real challenging one. The licensing questions as often with many others is not the problem. It is the technical part processing with all segregations of repsonsibilities where SAS is not following common accepted IT approaches, eg ITIL or the LCM with test/validate of images. The common reaction of IT managers is going for the SEP approach (Someone Else Problem). The most easy approach: making all the technical SAS issues a problem for the SAS-user. They know how to (use) SAS, so let them do all stuff. There will be no priorities anymore on that versioning and fixing part. You could make a Dilbert strip of it. Why did you leave off the various Version 7, 6 (and subversions of 6), 5, and earlier versions than 5? This is a trip down memory lane for some of us "antiques". I remember when Version 5 came out and thought it was extra slick. ;-) Version 6 was extra nice because we could now run it on a PC with a 5 MB hard drive and 640KB of memory. Some of this was back when the SAS documentation was just one book about 4 inches thick. (We used to think the purpose of SAS was not really selling software but publishing books (all the documentation was measured in bookshelf feet)! I started using SAS 76 as a graduate student. It is great to see this complete list. Times have changed. In August 1989, when I was at Columbia Presbyterian Medical Center as a grad student, I started off with some release of version 5 on the IBM mainframe (maybe an ISPF environment?). Do you know what version that would have been? 5.03 doesn't sound familiar. Maybe 5.8 something? There were about 10 host-specific releases in the version 5 time frame (1986-1989). You are probably thinking about 5.18 on CMS (and MVS) in June 1988. SAS 5.18 was also released on VAX VMS, Primos, and AOS/VS in March 1989. Just what I was looking for, Rick. Thanks! And from your later follow-up, I can see that I got on board with version 6.06 or 6.07.